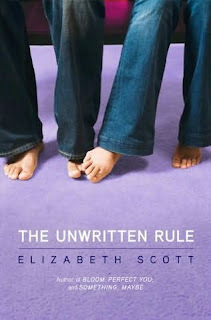 The Unwritten Rule by Elizabeth Scott finally has a summary!!! I'm so happy!!!! Everyone knows the unwritten rule. You don't like your best friend's boyfriend." Sarah is torn apart by guilt, but what she feels is nothing short of addiction, and she can't stop herself from wanting more. I so can not wait for this book!!! Its one I'm looking forward to most!!!!! It sounds great!!! Really cute cover, this is one I would look twice at. This sounds awesome! Thanks for sharing. Yay! I love Elizabeth Scott. I didn't know Elizabeth Scott had another one coming out. I'm excited! Oooh, this one looks yum. Thanks for the head's up! Hey girl, I gave you an award on my blog!! You deserve it! !